The mass-produced tomatoes we buy at the grocery store tend to taste more like cardboard than fruit. Now researchers have discovered one reason why: a genetic mutation, common in store-bought tomatoes, that reduces the amount of sugar and other tasty compounds in the fruit. For the last 70-odd years, tomato breeders have been selecting for fruits that are uniform in color. Consumers prefer those tomatoes over ones with splotches, and the uniformity makes it easier for producers to know when it’s time to harvest. But the new study, published this week in Science, found that the mutation that leads to the uniform appearance of most store-bought tomatoes has an unintended consequence: It disrupts the production of a protein responsible for the fruit’s production of sugar. Supermarket tomatoes are terrible. Anyone who has eaten one knows this, and the genetic reason why it’s terrible is just a bit of interesting conversation. Many supermarket tomatoes spend some time in cold storage, which just damanges them further. Refrigerating a tomato destroys aroma volatiles, and given that tomatoes don’t have much flavor to spare to begin with the whole thing is lost. But don’t despair! For many of us there are other sources of tomatoes readily available. Farmer’s markets are increasingly common sights, and at many of these one can find some beautifully colored heirloom tomatoes, rich in taste. After reading the above article I figured the tomato could use some good news, so I picked up a few of these tasty tomatoes and set out to put together a few sandwiches that didn’t just include tomatoes but featured them. Tomato sandwiches, not sandwiches with tomatoes. The first sandwich involved the above heirloom tomato, streaked through with greens and purples. Anchovies went down first, then a layer of pan fried cornmeal mush, then the tomatoes. Cornmeal mush is something akin to polenta or grits, just cornmeal and a bit of salt cooked in boiling water, laid in a pan and refrigerated, then sliced and fried. It is bland, but that’s kind of the point. Anchovies are salty as all get out, and I felt the sandwich needed something that would dial them back a bit. The mush did that, but in all honesty it didn’t dial them back quite enough. I like anchovies a lot, but I always feel that if they were 25% less salty they’d be the greatest thing on the face of the earth. The salt is part of the attraction, but as was the case here it’s often just too much. But enough about those two things. The story here is the tomato. This tomato was delicious. What an odd fruit tomato is, that one finds oneself not celebrating that the taste of a tomato is amazing, but rather that the tomato tastes like anything at all. But it was sweet, juicy and firm, and exactly the kind of sandwich around which one builds a sandwich. This could have been better, but with a tomato this good you’re willing to forgive the sandwich a few faults. The second sandwich was considerably more successful. Another three-ingredient job, a semi-tart orange tomato went on sourdough with avocado and black bean hummus. (The hummus was not much more than toasted garlic, black beans, and a bit of oil to smooth things out.) If I may praise my own doing, this is a strong example of the simple sandwich. It’s something that can be put together in just a few minutes for not much more than the price of cleaning the food processor, and it’s really quite tasty. Nothing involved overshadows the tomato, but the other two ingredients are quite flavorful on their own. In a nice example of why we bother with sandwiches in the first place, three good things go together and become great. 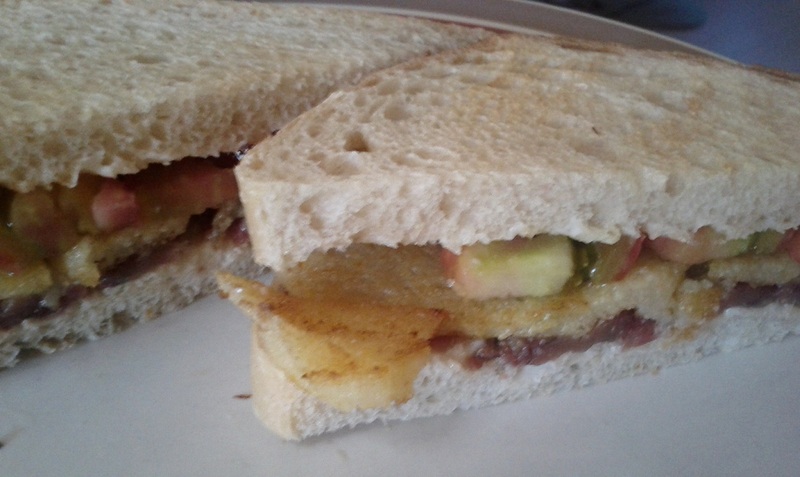 The third sandwich, the second with the heirloom tomato, was significantly more successful than the other. Sweet potato hashbrowns went down first, followed by sliced of tomato, topped by fennel that had been sauteed with garlic. The garlic had fried all the way to little crispy bits, and they were as tasty as you know such things to be. The sweet potato hashbrowns were crispy and had a rich sweetness that worked well with the brighter sweetness of the tomatoes. 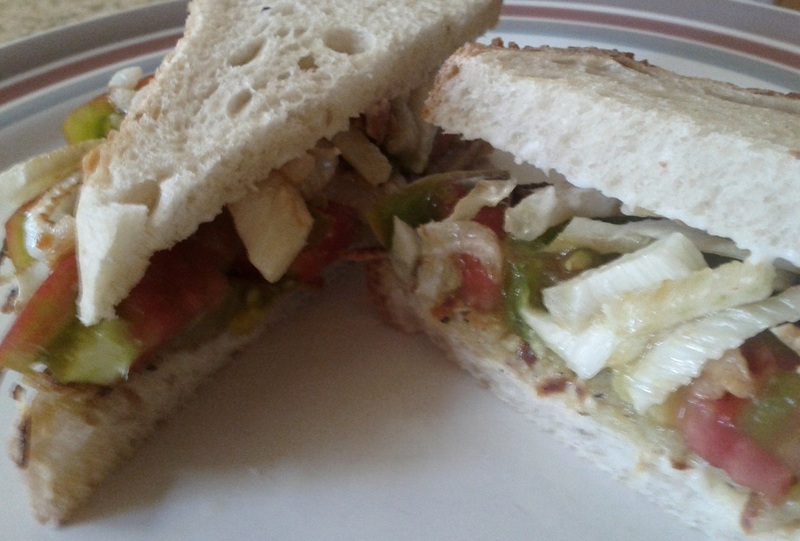 The fennel, of course, brought its own distinct flavor, and all of that came together in a really tasty sandwich. This isn’t drop-everything-and-try-it material, but if it sounds like something you’d enjoy I give it a strong recommendation. And if it’s been a while since you tasted anything other than the flavorless mush that is a supermarket tomato, I’d say you could find a worse starting point than this sandwich. 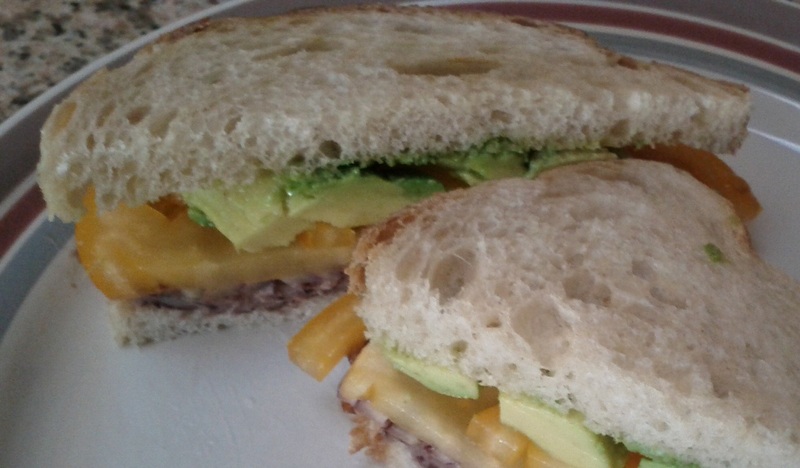 This entry was posted in Sandwich Reviews and tagged Reviews by Pete, Sandwiches I Have Eaten, Sandwiches I Have Made, Vegetarian by Pete. Bookmark the permalink.